Italy is the first country with the highest number of UNESCO World Heritage sites in the world. In a bit more than 300,000 square km there are 51 sites Unesco World Heritage sites and think how many are still to be included! If you have already been to Italy, probably you have seen one or two of them. Which ones? Rome – its city centre was recognized World Heritage Site in 1980. Two years later Florence city centre was included in the list too. I thought that visiting Italian UNESCO World Heritage sites is one of the many reasons why you should visit Italy and I’d like to talk about them during the month of April. Of course in the list you will find some of the most famous destinations in Italy. Apart from them you have the possibility to get to know another part of Italy, where there is no crowd and you can better experience the “living like a local” style. Heritage is our legacy from the past, what we live with today, and what we pass on to future generations. Our cultural and natural heritage are both irreplaceable sources of life and inspiration. I splitted Italy in 3 parts: the north, the centre and the south. So that it will be easier for you to plan your next travel in Italy. Below you will find the sites divided per Italian regions. Now it’s time to update your bucket list. Are you ready to discover Northern Italy Unesco sites? Turin is a magnificent city. I was there 2 months ago but for work and unfortunately I didn’t have the pleasure to go around. Obviously it is in my Italian bucket list and I have to come back soon. The city has started to be seen by tourists as a place to visit only a few years ago. 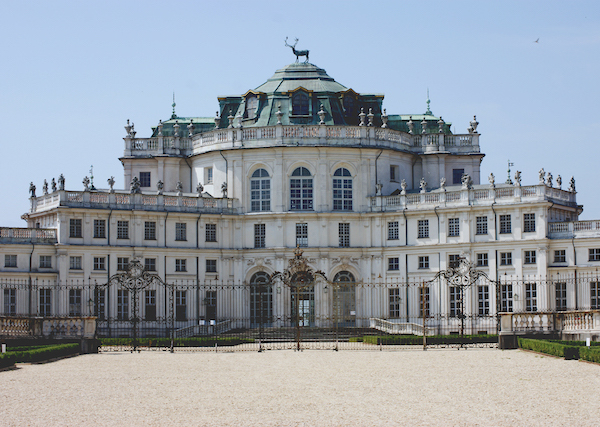 You have to think of Turin on the same level of Wien or Paris, because for a short period it was the Italian capital thanks to the Savoy family. The Savoy lived there for centuries. The Savoy Residences were declared Unesco World Heritage site about 20 years ago and they are really worth a visit. The ‘Sacri Monti‘ are religious complexes built in Piedmont and Lombardy starting from the end of the 1400s. At the beginning they offered an alternative to the Holy Land to pilgrims, whose travel to reach it was unsafe. Then they started to be a meditative and a prayers path. Stefanie has already written an article about them and you can read it here. This site is shared with Austria, France, Switzerland, Slovenia and Germany. It includes 111 settlements built from around 5000 to 500 BC and represent one of the most important sources for studying prehistoric societies. The prehistoric men used to build pile dwellings on marshy land close to lakes or rivers. They needed this building to protect themselves against occasional floodings. You can see these settlements in Piedmont, Trentino, Veneto. Piedmont is one of the best wine Italian regions and has many important areas where wine is produced. Have you ever heard about Barolo or Barbera d’Asti? They come from the Langhe-Roero and Monferrato vineyards declared Unesco World Heritage Sites in 2014. 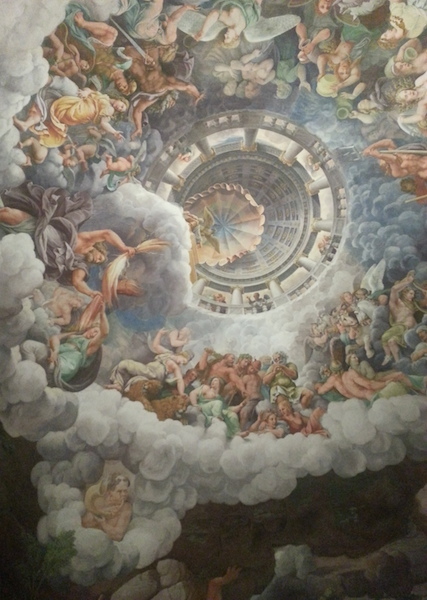 Fresco on the roof of Palazzo Te in Mantua. They were the 1st Italian World Heritage Site, declared by UNESCO in 1979. They represent the largest prehistoric petroglyphs collection in the world. There are more than 200,000 incisions in the valley. Claudia is going to talk about that in the next days. It is an industrial village created for workers in Crespi d’Adda. Cristoforo Crespi aimed to build a village where he could take care of his employees and their families offering them, not only a house, but also facilities like school, hospital, sports court and theater. The village was built around the Crespi’s cotton mill close to the river Adda. The experiment ended in the 1930s as the crisis started, but descendants of workers still live there. Among the Northern Italy Unesco sites you find also Leonardo or better his world-famous fresco “L’ultima cena” (The Last Supper) and the monastery where he painted it. I remembered when I saw the fresco for the first time in 1997. It is placed in the refectory of the monastery, where the lights were low and they were allowed only to 10 people at a time. Today the restoration is ended – after 20 years of work! -, lights are changed and it is not so dark there. When in Milan you can’t miss it! This is another site shared with another country. It has been ranked among Unesco World Heritage sites for its richness in fossil records of marine life from the Triassic period (250-200 million years ago). The Swiss side was declared World Heritage Site in 2003, but the Italian side only in 2010. Do you remember the “ideal town” concept of the Renaissance time? Unesco stated that Sabbioneta was built according to the canons of the Renaissance “ideal town”. Along with Sabbioneta, Mantua is an Unesco site thanks to its town planning. Studying the Italy’s history you will learn that after the Romans many people followed each other. Among them there are the Longobards. UNESCO declared World Heritage Sites the places of the Longobards power. There are 7 Italian cities included in the list of these places: Brescia, Cividale del Friuli, Castelseprio, Campello sul Clitunno, Spoleto, Benevento and Monte Sant’Angelo. I pass over Trentino Alto Adige, because the region shares its 2 World Heritage sites with 2 other Italian regions: the prehistoric pile dwellings in the Alps and the Dolomites. With peaks over 3,000 meters, the Dolomites are the highest mountains in Italy. Their mountain scenaries made of sheer rocky cliffs, vertical walls, long and narrow valleys were worth the nomination as Unesco sites. I need to add anything else? Venice is Venice. A romantic place where to go at least once in your life. After Rome and Florence then it comes this city. Venice has a unique location because it stands on 118 islands harbours. It preserves some of the most important architectural masterpieces and of the greatest works by world-famous artists. Not far from Venice there is Vicenza and its surroundings, that are really worth a visit. Many years passed by since I visited these places and I need to come back again. Unesco declared the importance of the city and the Palladian villas because of Andrea Palladio. He was the most important architect of the Republic of Venice. After Venice and Vicenza, visiting Padua is required. This city was one of the most important cultural centres for intellectuals in the 19th century. UNESCO ranked the Botanical garden founded in 1545 among the World Heritage sites; it is the oldest world’s academic garden still in its original location. In Pisa there is another garden one year older than this but was moved to a different place in 1591. I went there in 2014 and I discovered a marveillous city. In Italy it is famous for the story of Romeo and Juliet as well as the Arena, but there is much more than this. In fact it is an example of a gradually and continuously developed city in 2000 years integrating high quality elements of different periods. Besides it is an extraordinary example of European fortified city. Aquileia reached its major splendor during the Roman Empire because was used as defense of the oriental Empire border and as an outpost for the conquest of the Danube area. The archaeological area shows us a piece of the Roman life with statues, the river harbour, the walls and much more. The Basilica that you can visit played an important role spreading Cristianity in the Middle Ages. 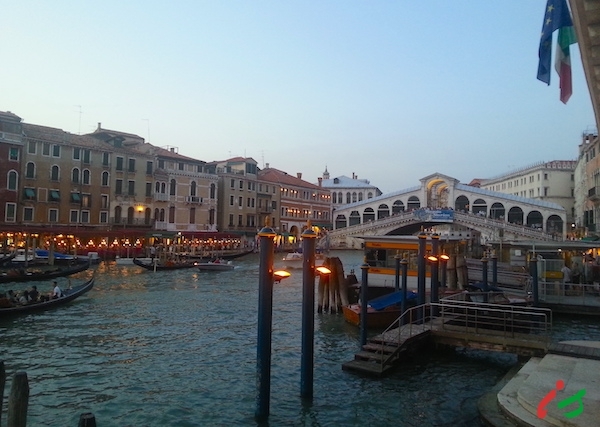 Ponte Rialto in Venice at sunset. The reason why these places are declared World Heritage site is the following “particularly scenic coastal area with small towns built among the steep rugged terrain”. Actually the coast in Liguria is quite completely rocky and is famous for its narrow beaches just at the feet of the mountains. 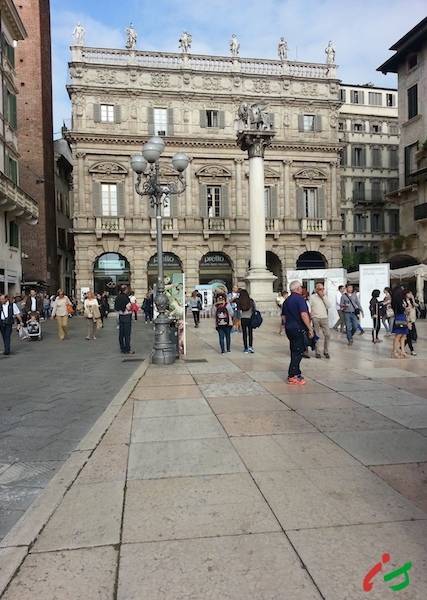 Have you ever been to Genoa? I haven’t. I need to visit this city because everyone that has been there told me it is a city that is definitely worth a visit. It wasn’t like this until 1992, when there was a complete restyling of the harbour area thanks to the famous architect Renzo Piano. The Strade Nuove (i.e. New Roads) are via Garibaldi, via Cairoli and via Balbi. These enclose Palazzi dei Rolli (16th and 17th century), where Rolli refer to noble palaces that could compete to host big personalities of that time.